Our charter bus services are available to cater to every kind of Church Trips needs. If you have a big church group with members, friends and relatives then we have a 61 passenger charter bus options for you. For smaller church group we have a 20 passenger mini bus rentals and many other sizes above. Our coach buses are fully equipped with all basic amenities and luxuries to make your journey an enjoying voyage. These coach buses have huge space to keep baggage and luggages, comfortable windows to view the beautiful sights outside during your travel. All our luxury coach buses have separate compartments for luggage to make it more comfortable and have open spaces in between passengers. The journey of Church Trips should be touched with pacifying and calming things to make your passengers feel more spiritual. Our luxury charter buses have television and DVD players, why no give your members a spiritual movie to view of the churches and pilgrimages you are visiting or the ones you can visit for your next church trip. We also offer a great surround sound music system that will provide you spiritual songs or music to boost up the religious spirit onboard your charter. Charter Everything places more importance on the safety of our customers. Our charter buses we offer are equipped with proper surveillance system to catch any unwanted move; they have proper compartments to keep passengers luggage safe. We only hire licensed CDL drivers and check they’re past DOT records. Charter Everything will make sure that driver is acquainted with all the possible routes and shortcuts along with routes which are more peaceful and have beautiful sights for your group to enjoy. Our bus drivers take all the responsibilities, like dealing with directions, tolls, parking and traffic delays. With all such incentives and exciting charter bus services, you should select Charter Everything for your next group travel. Whenever your plans for Church Trips erupts you just need to give us the call. Our customer care staffs are always waiting to answer your queries. We’ll make sure that your church trips should be the best one of your life. Charter Everything has years of experience to provide highly advance vehicles for your Church Trips, at affordable prices. Our goal is to provide quality transportation through advance fleets and extraordinary service. Our staff is very polite and trained to assist you with any problems or questions you may have, as well to help assist you pick the best bus from our fleet for your group size and budget. We believe in an increase of clientele by providing the lowest price possible for all types of trips. 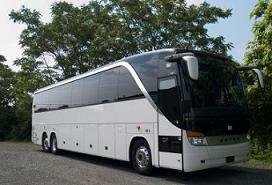 Just call one of our agents and get a free charter bus quote 855 NY NJ BUS or 1-855-696-5287!